A walker taking part in a challenge event was airlifted from a Lakeland fell after injuring herself in a stumble. 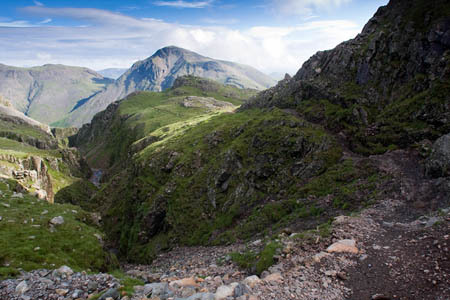 The 27-year-old was on the Corridor Route, which leads from Sty Head towards Scafell Pike, when she injured her hip on Saturday. She was unable to bear weight and called for help. A spokesperson for Keswick Mountain Rescue Team said some misunderstanding as to whose area the incident was in – Wasdale Mountain Rescue Team was also alerted – but the Keswick team sent a Land Rover with six team members about 4.35pm to Seathwaite in Borrowdale. An air ambulance also flew to the site. A total of 13 Keswick team members were involved in the rescue. Stumbles are the natural hazards of fell walkers and the corridor route has sections that require patience and thought. It is used by many thousands each year and negiotiated safely on virtually every occasion. It's real risk is through lack of planning or experience, straying from the safe path into areas of danger. If part of a challenge event she will no doubt have been in company and the incident quickly reported. The skills and committment of the Keswick and Wasdale mountain rescue teams and that of the air ambulance crew should rightly be highlighted on every incident of this nature. The MRT's give of their own time to save people in need of assistance. An incident of this nature should not deter people from finding enjoyment achieving the lakeland peaks, but each is a reminder of the need for carefull preparation to minimise the risk. I wish the lady a speedy recovery.